Attractive, completely furnished, two bedroom, two bath house bordering the Centro area of San Miguel. From its location in the San Antonio district it is an easy (5 min.) walk to the Instituto Allende (Art and Language School), and a 10-13 minute walk to the Jardin (center of town). It is a easy, level walk to the Warren-Hardy Language School. The house is located in a neighborhood containing both Mexican families and foreign residents. It is a safe area and close to a produce and flower market. (I will be happy to provide directions to the closest grocery shopping!) In this casa you will get a taste of everyday Mexican culture, yet be within walking distance of the primary sights and events that San Miguel has to offer. You will have panoramic 360 degree views of the city and surrounding mountains from the roof terrace and second-floor patio. Living room with cable TV, gas heat, full kitchen, office alcove, telephone, and high speed internet hookup. Once a week maid service provided with rental, more often if you wish to arrange this with the maid. Rentals include utilities, excepting phone beyond basic monthly local service, and any usage beyond the first tank of gas (usually free for all but long-term rentals). You have seen that our prices are among the lowest on this website. We would rather have happy renters than hold out for a higher price. From the moment I booked Casa Amistad I felt well taken care of. Tina, the owner, was very helpful answering my questions. She was genuinely concerned that my stay in her house would be a good one. Flor, the house manager, and Ophelia, the housekeeper, were fantastic. They kept the house well run and clean. Flor was on top of any problem that arose. As for the house, it is charming, very clean, and very Mexican. The two terraces have lovely views of the town. If one terrace has shade, the other has sun, and vice versa. The street is relatively quiet, as there is little traffic. There is the occasional dog and church bell, but that is part of the charm of the town. On one corner is a lovely cafe serving breakfast, lunch, and very good capuccinos. There are 2 little stores to buy milk, some fruits and vegetables, and other necessities. It is in a great location, and has a neighborhood feel. I hope to return to Casa Amistad in the future. VERY SPACIUS, QUIET AND VERY WELL TAKEN CARE OF. IT WAS A VERY NICE EXPIERIANCE. Victor we are thrilled to learn you enjoyed your visit and would be happy to welcome you back anytime. Thanks for taking the time to leave your remarks. We stayed at Casa De Amistad last year and felt fortunate to be able to book it again this year as we have heard that it is very difficult to find accommodation unless you book a year in advance. 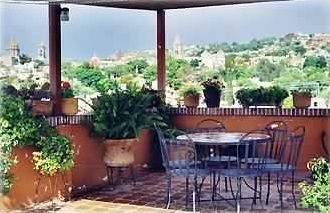 We loved the location as it is a short walk to San Antonio, organic market, the Centro. As always Flor met us upon our arrival to give us the orientation. We had to call her once throughout our visit and she responded very quickly to our problem with the wifi connection that was solved very quickly. The residential neighbourhood was not as quiet this year with construction next door and nightly barking dogs! We were out usually all day so construction was not a bother but you could not sleep with windows open due to the street noise and barking dogs. We noticed this year that the bathrooms are in need of some upgrades. The shower tiles, bathtub need to be grouted again, cleaned or redone completely. This would greatly improve the over all appearance of the bathrooms. We spent many nightly hours on the rooftop and would highly suggest more comfortable chairs with seat pads. The rooftop is large enough to accommodate more seating or lounge chairs. Thanks terry..I appreciate your comments and will indeed address the seating and the bathroom suggestions. Sorry about the noise next door...all of San Miguel feels like it is under construction. Hopefully that will slow down a bit soon. Hope you decided to join us again. It's like having your own vacation property in San Miguel, except you get a bonus manager (Flor) and owner (Tina) who strive to make your visit pleasant and burden free. The value is good and appropriate. Your pleasant experience starts with speedy and good communication with Tina. We booked well in-advance; Tina kept in-touch, helped with suggestions and delivered as promised. Flor met us at the property, showed us how everything worked and provided her contact details, just in case. The property was fine, we never had cause to contact Flor until we reconfirmed our check-out. The property is as represented, with the small caveat that the bed in the second bedroom won't sleep two individuals, unless both want to be intimate with the other. To be clear, if one individual intending to sleep in the second bed is much bigger than 5'10" or 150 lbs, or if you have teenage brother and sister, then only one will fit in the bed and the other will be on the couch cushions downstairs. The view is great as represented, with the caveat that it's not 360 degrees panoramic. The view to the St. Michael Archangel church is not obstructed as of Nov 2017 (and it's better than conveyed on the website photos); but the view is channeled between the rising fourth stories of neighbors. You can't see the whole downtown; but the roof patio is large and fine to enjoy the sunrise or sunset over the St. Michael Archangel church; plus, the view about the town is also good. When booking and enjoying this property, recall my description that it's just "like having your own vacation property." It's not your best linens, couches, mattresses, appliances, etc. Everything is clean and fresh; house appearance is fine (and in keeping with San Miguel ambiance). Everything works great, for a vacation. Don't use hot water at bedtime; the hot water heater works great but it's noisy! Expect some toilet smell in the guest bathroom. Don't expect a hotel or the house to be like your main home. You are in a residential neighborhood: very safe at all times. It also means that it's not quiet. Cobblestone streets amplify road noise and almost all neighbors own a non-stop barking dog. Watch your steps too: don't twist an ankle nor step on a sidewalk pet mess. The property is not a long distance nor steep walk from central downtown (Jardin), although at the end of a long day you are grateful that it's mostly downhill back to Casa Amistad. For us, it was no more than ten minutes downtown. Cozy multi-level house with 2 nicely decorated bedrooms. Very centrally located. We had a wonderful stay at Casa Amistad. The manger Flor was very attentive and accommodated us at late check in time. We parked car at the front door and walked everywhere, not moving until we departed. Quiet neighborhood away from main drag. Clean, nicely decorated home. We would like to go back to this casa again in the not too far off future. Stuart we are delighted that you had such a positive experience at Casa Amistad . There is something so magical about San Miguel and I always feel like the real heart of the place is in the neighborhoods, like our San Antonio neighborhood. Thank you for taking such good care of your temporary home, and we would be delighted to welcome you back again. Casa de Amistad is located in the San Antonio neighborhood of San Migue de Allende, and is just 2 Blocks from the Instituto Allende (Art & Language School)! LifePath retreat and wellness center is just a few blocks away, an easy walk. There are several open air markets for fresh produce, hand made cheese, tamales and fresh fish, poultry and other delectables within easy walking distance. the main supermarket, Mega, is an easy cab ride or walking about 30 minutes away. and the Parque Juarez, which hosts events, exercise, children playground, basketball courts, art shows, festivals, weekend Zumba and much more is also just a few blocks away. And a great location to just sit, relax, read, people watch.. The San Antonio neighborhood of San Miguel is home to many wonderful restaurants, the San Antonio Church ( roman catholic), little shops and bakeries, massage, and the list goes on!